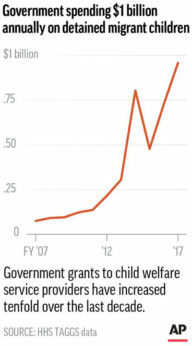 SAN ANTONIO (AP)—Detaining immigrant children has morphed into a surging industry in the U.S. that now reaps $1 billion annually—a tenfold increase over the past decade, an Associated Press analysis finds. Health and Human Services grants for shelters, foster care, and other child welfare services for detained, unaccompanied, and separated children soared from $74.5 million in 2007 to $958 million in 2017. The agency is also reviewing a new round of proposals amid a growing effort by the White House to keep immigrant children in government custody. 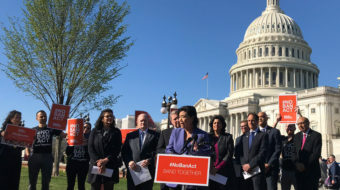 Currently, more than 11,800 children, from a few months old to 17, are housed in nearly 90 facilities in 15 states—Arizona, California, Connecticut, Florida, Illinois, Kansas, Maryland, Michigan, New Jersey, New York, Oregon, Pennsylvania, Texas, Virginia, and Washington. The agency’s current facilities include locations for what the Trump administration calls “tender age” children, typically under 5. Three shelters in Texas have been designated for toddlers and infants. Others—including in tents in Tornillo, Texas, and a tent-and-building temporary shelter in Homestead, Florida—are housing older teens. The recipients of the money run the gamut, including nonprofits, religious organizations, and for-profit entities. 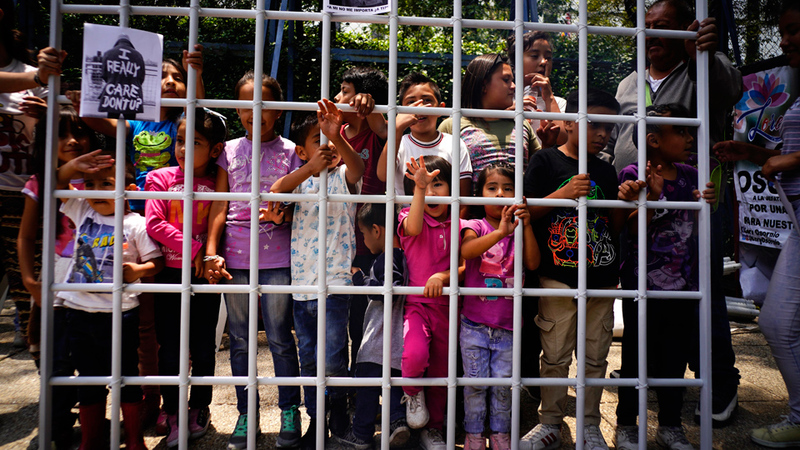 The organizations originally concentrated on housing and detaining at-risk youth, but shifted their focus to immigrants when tens of thousands of Central American children started arriving at the U.S.-Mexico border in recent years. They are essentially government contractors for the Health and Human Services Department—the federal agency that administers the program keeping immigrant children in custody. Organizations like Southwest Key insist that the children are well cared for and that the vast sums of money they receive are necessary to house, transport, educate, and provide medical care for thousands of children while complying with government regulations and court orders. The recent uproar surrounding separated families at the border has placed the locations at the center of the controversy. 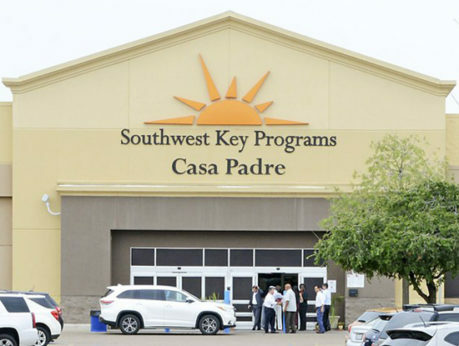 A former Walmart store in Texas is now a Southwest Key facility that’s believed to be the biggest child immigrant facility in the country, and First Lady Melania Trump visited another Southwest Key location in Phoenix. In April, Attorney General Jeff Sessions announced a “zero tolerance policy” directing authorities to arrest, jail, and prosecute anyone illegally crossing the border, including people seeking asylum and without previous offenses. As a result, more than 2,300 children were turned over to HHS. 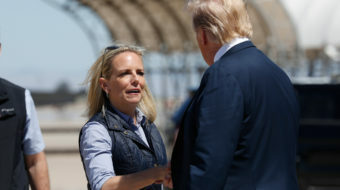 Some in the Trump administration describe the new policy as a “deterrent” to future would-be immigrants and asylum-seekers fleeing violence and abject poverty in Central America, Mexico, and beyond. But Steven Wagner, acting assistant secretary for the Administration for Children and Families—an HHS division—said the policy has exposed broader issues over how the government can manage such a vast system. A judge in California has ordered authorities to reunite separated families within 30 days—and the government has completed more than 50 of the reunions of children under 5 by Thursday. 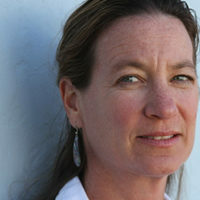 Pulitzer prize-winning Associated Press National Writer writing breaking news, enterprise and investigative reporting from Silicon Valley. 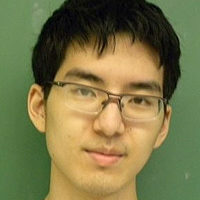 Larry Fenn is a data journalist at Associated Press. His stories have covered gun violence, education and the economy.